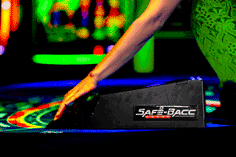 Safe-Shoe prevents dealer errors by eliminating the possibility to overdraw or under draw cards. 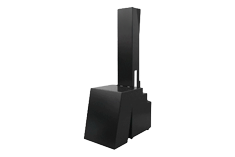 Compact sized with remote touch-screen display and instant delivery of Baccarat game results to i-SCORE™ PLUS display. 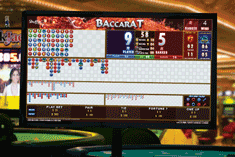 i-SCORE™ PLUS 24" double-sided Baccarat display offers industry leading graphics and animations, making it even easier to attract players, while displaying game round results and trends. 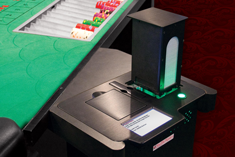 MD3® counts, verifies and shuffles batches up to eight decks of cards quickly and quietly, alerting the dealer of missing, added or swapped cards.